Applying yellow tone is an effective method for improving the three-dimensional appearance of a shaded relief. The grey relief shading is combined with a bright yellow tone on the sunlit slopes. Inverting the grey scale shading and masking the flat areas can produce a printing plate for the yellow tone. 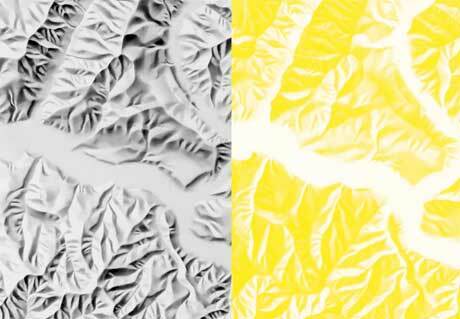 Grey scale shading from a © swisstopo map 1:25,000 (left). On the right the negative of the same shading in yellow. Flat areas have been masked. In the swisstopo maps the yellow tone is not only masked out in the plains, but also in scree and rock areas, thus emphasising the vegetationless, stony character through the black colour of the rock depiction. Top left relief shading, top right yellow tone, bottom left map with relief shading, bottom right map with relief shading and yellow tone © swisstopo. The yellow tone is also accomplishable with modern digital tools. Tom Patterson published a tutorial explaining how to apply coloured illumination to shaded relief images using Adobe Photoshop.